Towards the end of the incredibly successful, inspiring Apollo moon-exploration program, NASA was planning for permanent human presence in space. 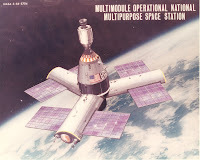 By the mid-seventies, they expected to have a 12-person space station orbiting the earth. By the early eighties, a 50-person station. A few years later, a 100-person outpost. The key to making all of this work was a reusable (economical) space vehicle that could shuttle people and cargo between the Earth's surface and the space station. Then the Richard Nixon administration killed the Apollo program mid-stride. According to NASA Administrator Michael Griffin, "That administration cancelled the last three Apollo missions -- for which the hardware had already been bought and paid for -- and did not fund any significant successor program… Nixon took us out of lunar exploration." Jerk. Griffin was interviewed during NOVA's "Space Shuttle Disaster" episode. "The mistake of the post-Apollo years -- a mistake, frankly, which belongs squarely in the Nixon administration… was the decision that the United States would no longer go beyond low Earth orbit." Even then, Nixon "scaled back" space station plans, but strangely enough, supported the space shuttle. Why? What's the point of a space SHUTTLE if there's nothing to shuttle things back-and-forth to? Thanks to Nixon's lame half-vision, we had the lame space shuttle program. "So astronauts, for 20 years, just flew into space and did some experiments and then flew back. Well, that was never what the shuttle was designed to do," space policy expert Howard McCurdy told NOVA. "It was designed to be a transportation system, to go someplace else, but it eventually became, because of the lack of money, its own destination."